It took eight years for Jonathan Blow to create his follow-up to Braid. It was worth it. We're obsessed. I’m not finished with The Witness yet, or maybe it’s more apropos to say The Witness isn’t finished with me. My surroundings tell the story of this review—a marked-up pad of graph paper, two notebooks with hastily-scribbled notes, two well-worn pens, a whiteboard covered in arcane markings, and an inked-up envelope I grabbed off my nightstand to jot down a potential solution last night. The powers-that-be have asked us not to spoil anything about The Witness. It is hard. 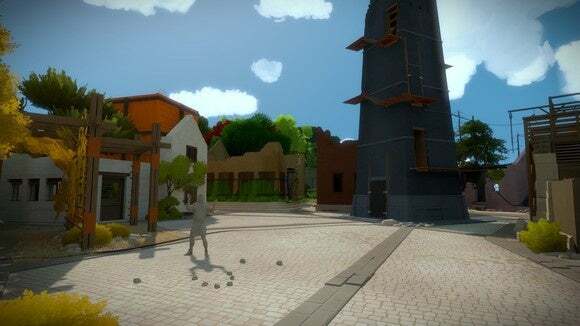 There is much I would like to say about The Witness, but thinking back to the beginning I realize most of it is dependent upon some moment of revelation, some hasty experiment that actually worked. Things, in other words, that should not be spoiled. You start at the circle part, you draw a line to the little rounded exit thing. 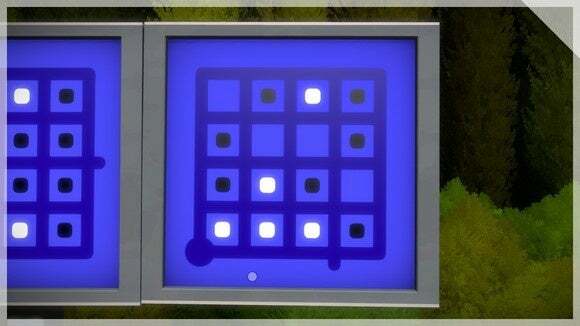 And in playing The Witness, you do that something like 500 times. If you’re thinking “That sounds comically easy,” well, you’re wrong. And if you’re thinking “I don’t think there’s enough here to hold my attention,” well, you’re probably wrong again. 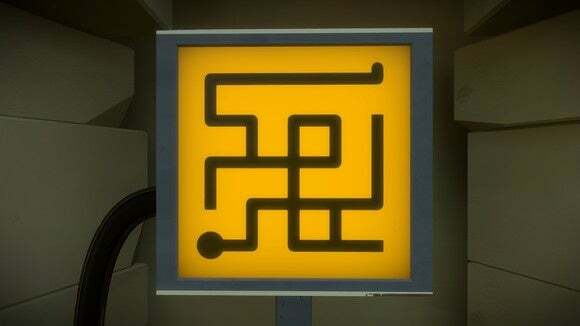 I’ll admit, the line puzzles on their own probably wouldn’t be enough. You wouldn’t want to pick up a book of line puzzles and fill them in, one at a time. Or a phone app. The purely mechanical side of the game is absolutely helped along by some esoteric eye-candy. 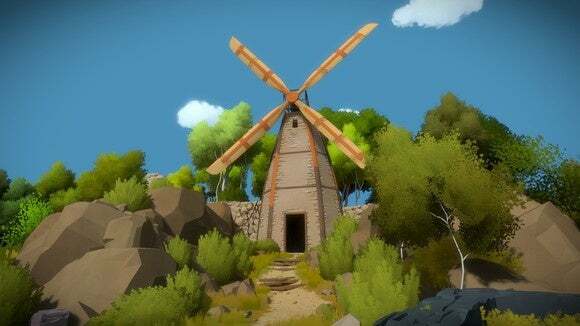 See, puzzles in The Witness are scattered around a fairly large island, broken up into distinct zones—a quarry, a castle, a dock, an orange forest, a desert, and et cetera. Walk into an old Egyptian-esque temple, there are line puzzles. Inside the boathouse? Line puzzles. Scattered amidst the trees? Panels with line puzzles. But that’s all set-dressing. It’s a motivation, and certainly an important part of the game, but it’s not what makes The Witness so compelling. Which is not to say games can’t be good with a lot of different mechanics to master. I merely use it as a counterpoint. 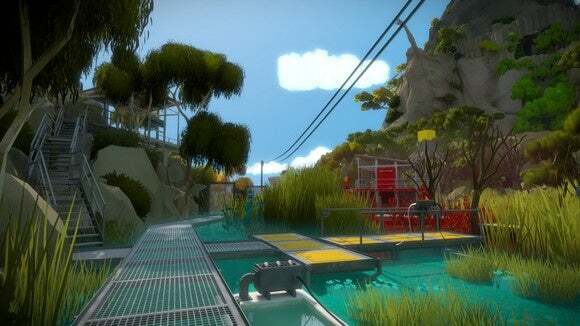 In The Witness, you have one means of interacting with the world. One. You click, you draw a line, you end the line. And yet as new rules are introduced, something as simple as “draw a line” becomes a hellish endeavor. I’ve never been more aware of how many possibilities are afforded by a five-by-five grid than while playing The Witness. You’d think you could brute force something this mechanically simple, and given enough tenacity you can, but it’s not a great course of action if you value your time and sanity. Instead you leave. You draw shapes on graph paper. You eat dinner. You sleep on it. You come back and...there it is. The solution, so obvious in retrospect. Or maybe you still don’t get it, so you wander off to a different part of the game. It’s encouraged. There’s a lot to explore, and The Witness doesn’t care what order you explore in. Ah, well, there we go with spoilers again. Suffice it to say, it’s a lot harder than you think and discovering why it’s so hard is in large part what makes The Witness great. The Witness has taken hold of my brain, both waking and sleeping. If I’m awake, I’m playing. If I’m not playing (for whatever reason) I’m inking possible solutions into a pad of graph paper. Writing this review I’ve solved two more puzzles and I think have a lead on a third. It’s compulsive. When I’m done and this is all filed away, I’ll go right back to playing. And asleep? I dream about The Witness. I’m not joking—it happened last night and I’m still feeling a bit weird about it. Grid lines do not make for a pleasant night’s sleep. It’s a brilliant puzzle game, and one I suspect still holds plenty of secrets, even after twenty hours and seeing an “ending.” There are gates I still haven’t managed to unlock, paths I haven’t found the entrance to yet, theories I still need to test. Everything looks like a hint. Everything looks like a red herring. I love it.